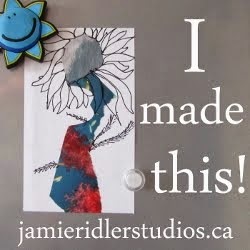 I am taking an online workshop led by Kathryn Antyr at TrueNorthArts.com. It is a personal retreat workshop and since I don't want to take away from what she is doing, I won't put in too many details. But I would suggest if you are interested in creating sacred space for yourself you consider checking into what Kathryn offers. 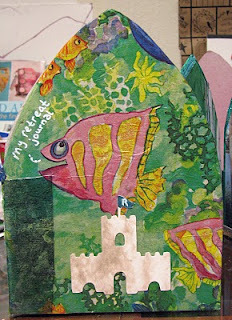 Here are some pics from the journal I am working on as I go through the workshop. My favorite place is by the sea and if I can't be there (since I live in MO) I try to find time often to spend in nature by water. Being in nature (hopefully looking out at water) is my sanctuary. Creating this little mobile "altar" to nature gives me a place to pause. The hands reaching and touching inside the heart is how I feel when I am outside in a quiet place filled with all sorts of plants and animals. I feel especially close to God then and I feel like we are connecting in a very spiritual way that doesn't happen inside. The image of the hands is by Meganne Forbes. 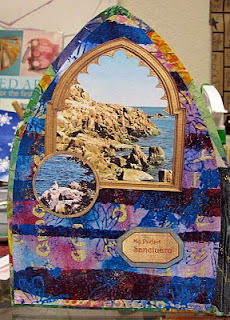 As I read about sacred spaces and "altars", I realized I had many examples around my house in how I chose to decorate and show off keepsakes from or about special family and friends and travels. 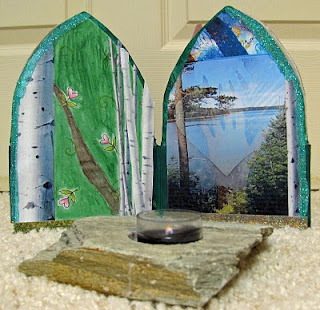 I have included a couple of pics that seem to fit my idea of "altars". One is a shelf with some artwork my daughter made when she was little and a pic from her starring as Alice in Alice and Wonderland. The other picture is of a shelf with my sons little rubber boots and other things with his pic and below his shelf is a shelf with a fan and glassware that belonged to my Grandma. Even the cabinet these shelves are in honor my grandparents. 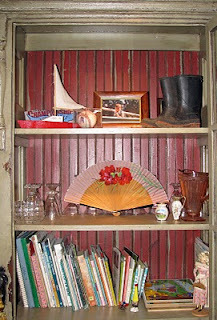 The cabinet is made from the front doors of their farmhouse that I spent lots of time in with them. They chose to sell the farm because of health issues. Eventually, a church bought it and was tearing it down. I was able to buy some of the doors and an eight pane window. Michael Moore in Hannibal, MO was making cabinets out of old salvaged materials, and I had this made from the doors so I will always have part of the house where so many special memories were made with me. All over I have curio cabinets or vignettes that have special objects that help me remember special people and times. I am learning to pause and appreciate their presence more. I know the people are the important part and not the objects, but since the people can't always be here, it is nice to have something that represents them. I am running a little behind with the workshop. Life got a little hectic for a while. But since it will be open until in March I am good and choose not to feel pressured. Very, very nice Susie! I, too, am in this personal retreat class and I haven't created my retreat house yet, but you've inspired me to get a-going on it. I think I will. Thank you for sharing your love of the sea with us. I agree, it's a very soothing and close to God kind of place to be. I've enjoyed reading through your comments and reflections about your journal and sacred spaces. I too find a connection to the divine in nature. The cabinet is so special. I'm so happy for you that you were able to acquire the doors to make the cabinet. Thank you for sharing! I'm happy to see that you are enjoying the workshop. It is good that you don't feel pressured. Take your time and savor the journey. Your cabinets from the family farmhouse doors are so wonderful!!!! I like all the momentoes (sp?) you keep and understand why! Off to work my page in your "Art Saves" journal, now. BTW making the cabinets was just another example of "Art Saves", LOL!